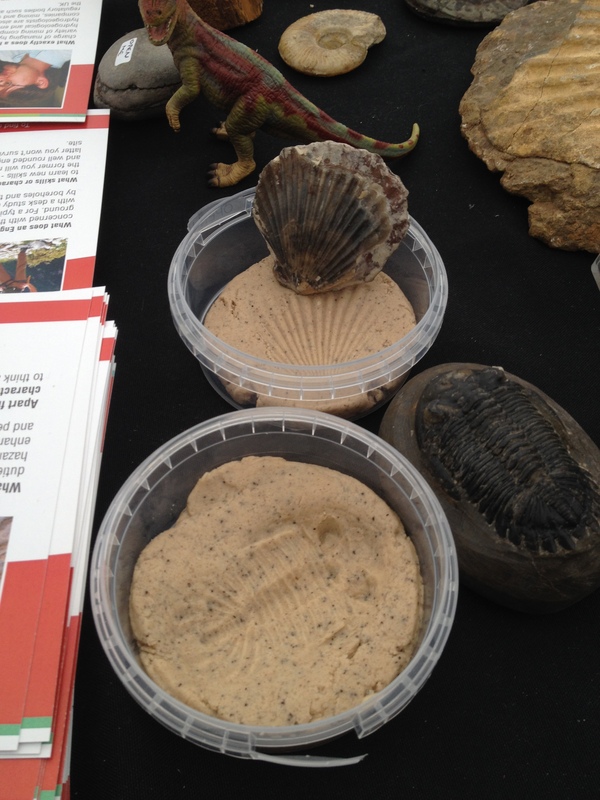 The Lyme Regis Fossil Festival – make your own fossil cast! 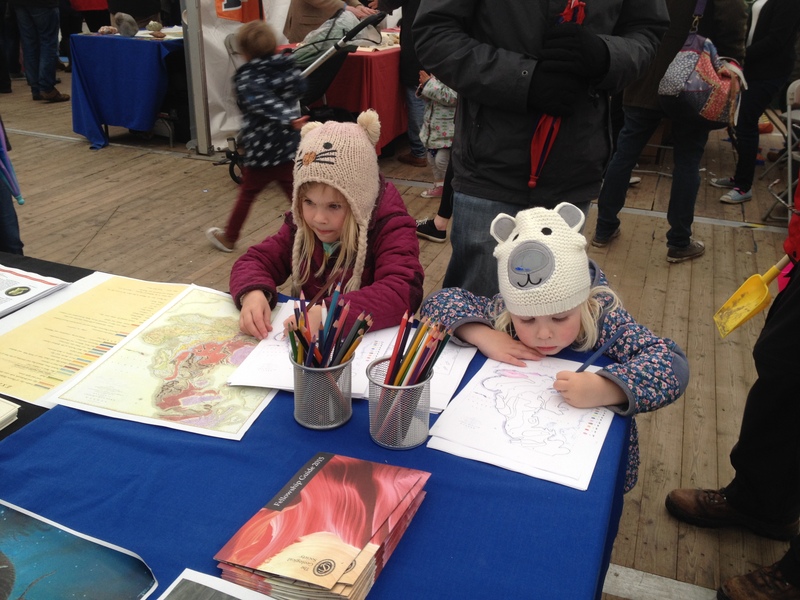 A couple of weeks ago, we headed to Lyme Regis for the annual geological extravaganza that is the Lyme Regis Fossil Festival, armed with fossils, badges, geological colouring in and a brand new activity. 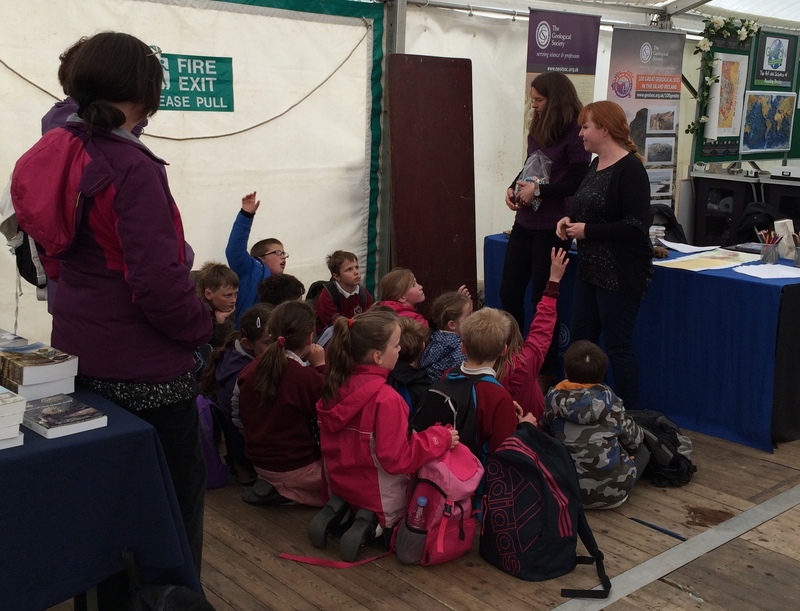 This year, for the first time, we took part in the schools programme, talking to over 140 primary school children about all things geological. As we’re celebrating the Year of Mud and the William Smith Map Bicentenary, we wanted to take a long an activity which would relate to both. Many thanks to the palaeontologists from Leeds University and the Palaeontological Association for inspiring our solution! If you’re taking the activity to a festival or other event, we recommend pre preparing the dough – but if you don’t mind making a mess, you can make it part of the activity! Mix the flour and salt together, and add enough coffee to create a fairly stiff dough – not too sticky. Add in some used coffee grounds for an authentically sandy texture. Once the dough is kneaded together, you can roll it out on some grease proof paper, or press it into a small container. Piles of pots ready for the festival! Then, all you need are some fossils suitable for making a good impression. Press them into the dough, and they will leave behind a cast. You can also use toy plastic animals to create footprint trace fossils. If left with the lid off for a few days, the dough should harden, creating a rock like trace fossil for you to keep! You can use this activity to link to lots of ideas about fossils. Fossil casts are the print left behind by a plant or animal on the surrounding material. What kinds of materials would be best for capturing and preserving imprints? Why do only some parts of the fossils survive? Where is the fossil itself, and what might have happened to it? Identifying and understanding fossils was a crucial part of William Smith’s work to create his first geological map of England and Wales. By using fossils, Smith was able to establish a relative chronology which allowed him to identify strata of the same age and show where they occur at the surface. We also took along our ever popular colouring maps of William Smith’s map, and the geology of the local area. 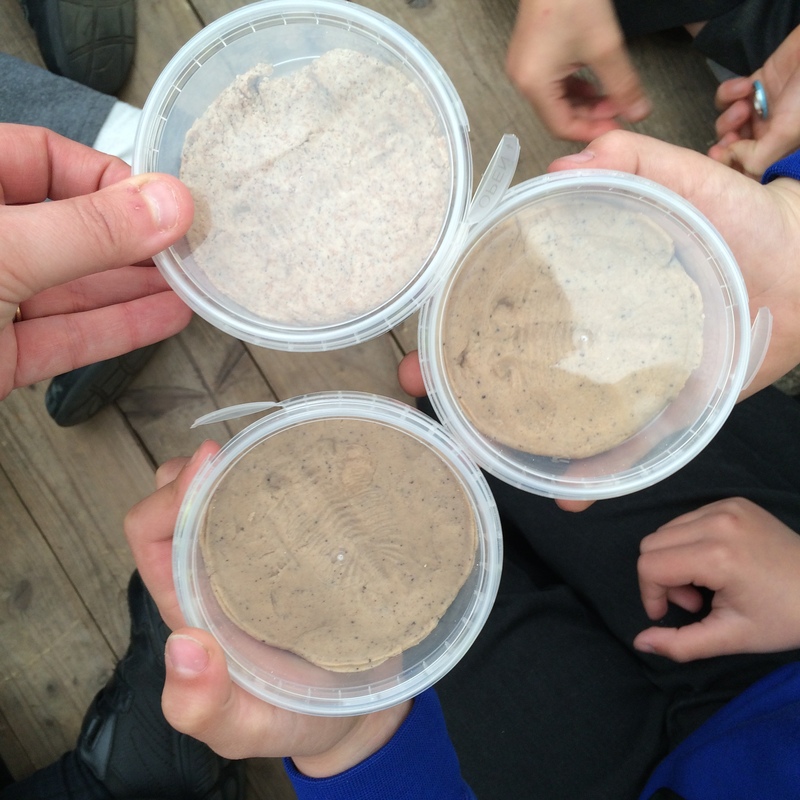 If you have any suggestions for other mud-based educational activities, we’d love to hear them! 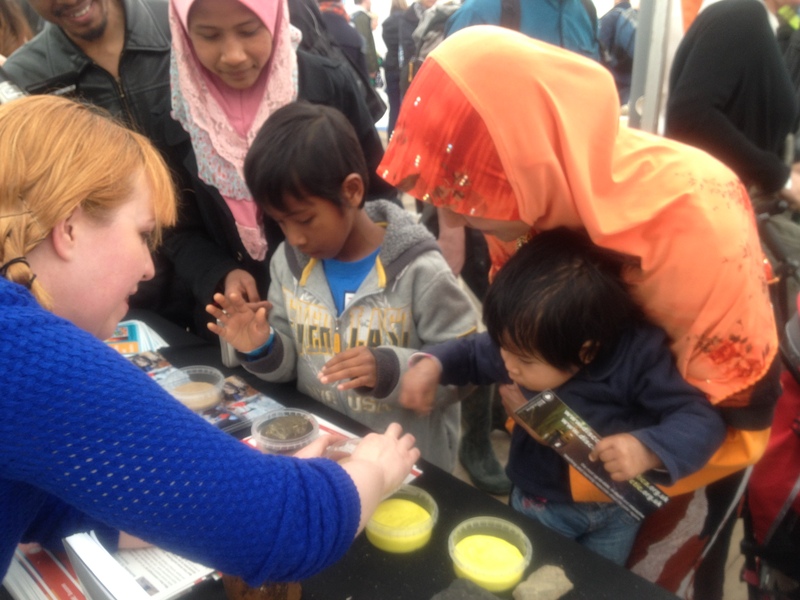 And remember, Earth Science Week 2015 is only 5 months away – 10-18 October. Some great activities have already been planned, and we look forward to receiving many more. For the first time this year, we have a number of small grants available to help with running Earth Science Week events – visit our website for more information. 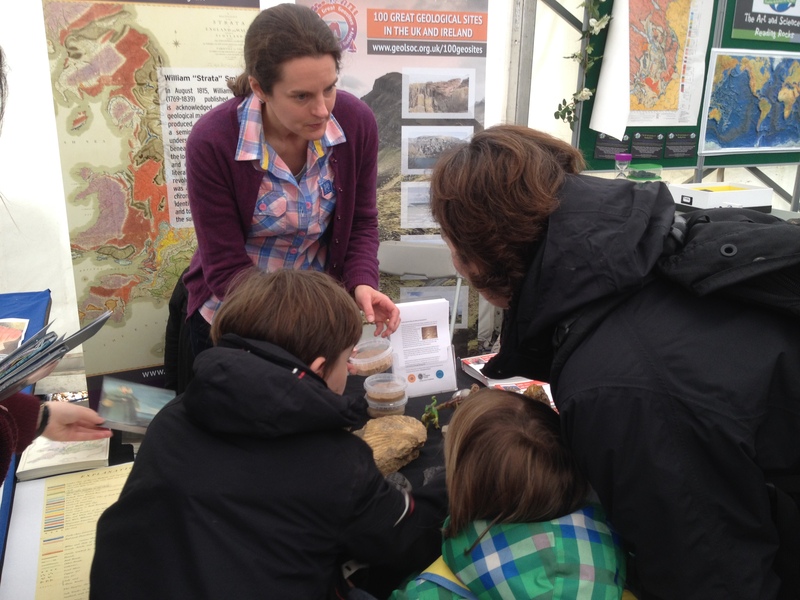 Many thanks to the GSL Fossil Festival team – Judi, Flo & Hazel! 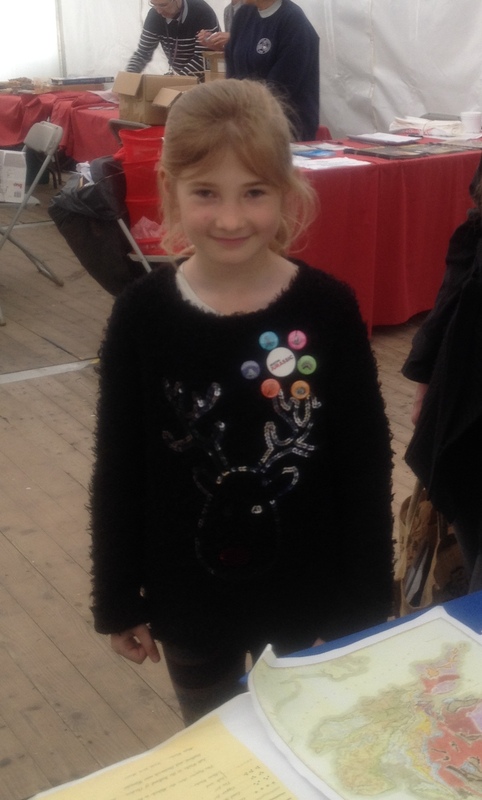 Tags: activities, communication, earth science week, education, fossils, geology, Lyme Regis, maps, outreach, palaeontology, William Smith. Bookmark the permalink.